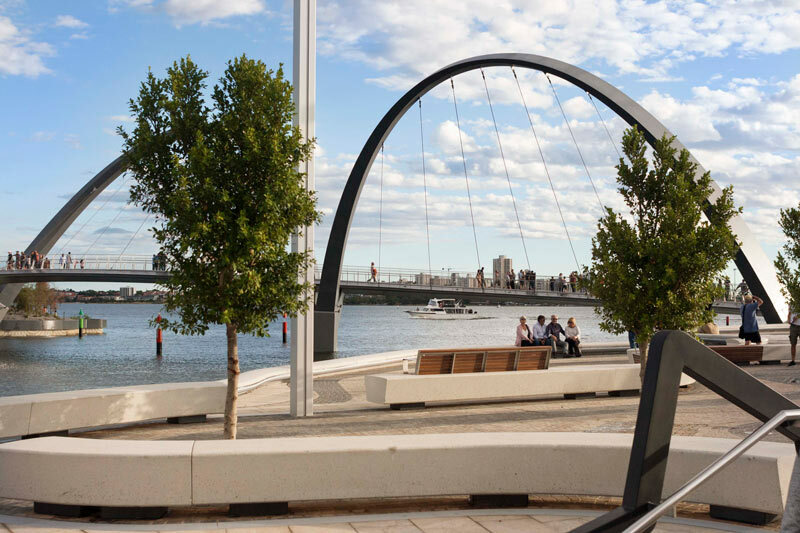 Perth’s newly created waterfront precinct has been years in the making and last weekend, Elizabeth Quay finally opened! *happy dance* Have you visited? What do you think? Like the premier of Western Australia said, ‘this is a one-in-100 year change,”. This project has certainly transformed the city’s skyline and it’s almost surreal seeing the water and skyline close together in photos posted around social media this week, a significant visual change to the city’s foreshore area. 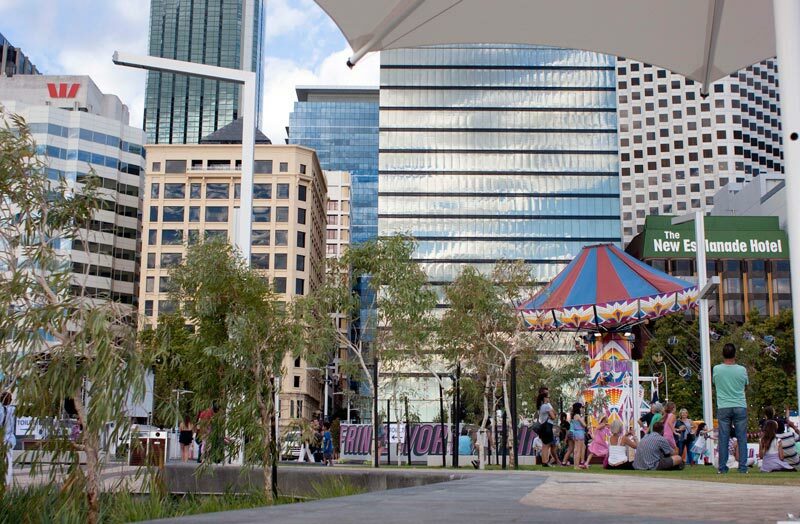 Elizabeth Quay offers a space to hang out in the city with some pleasant views. Forrest Chase is good and all, but it’s fantastic to have another spot especially one that connects to the river cycle path, I can’t wait to cycle route along the Swan River. Given the project is not 100% finished and throw in a financial economic down turn not just locally but globally, I still think this has been a project that gives back to West Australians, even though it’s not exactly the same as the computer generated design images we’ve all seen on TV. 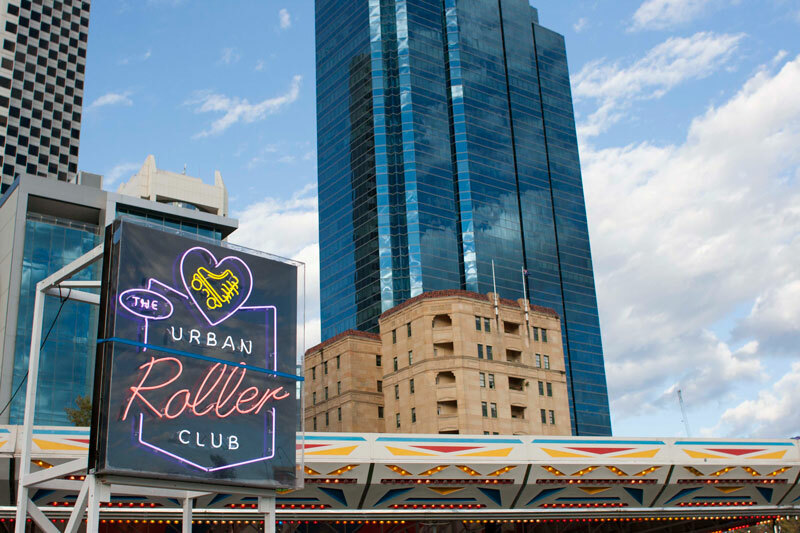 The primary vision to reconnect life from the city to the river will hopefully create some community buzz in the area. It’s all happening! 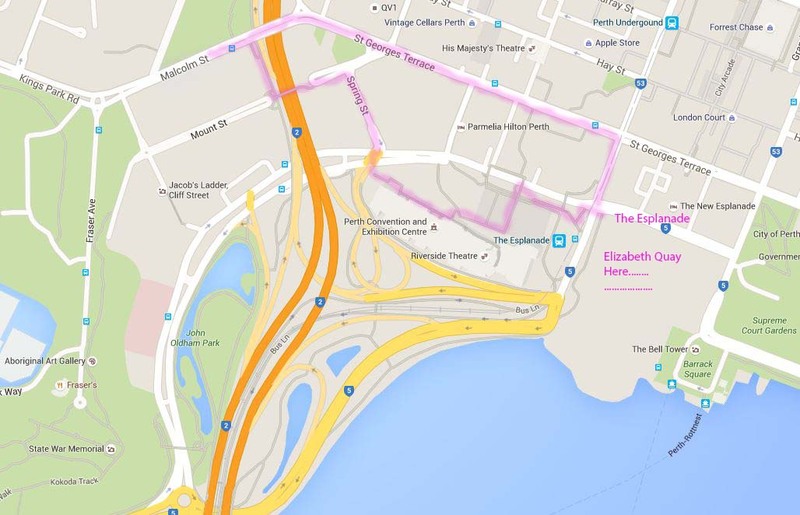 I am sharing with you a walking route that incorporates part of Perth’s west end and offers free parking on Sunday! It’s a great route if you’re interested in urban landscape and photography as well as avoiding crowds. 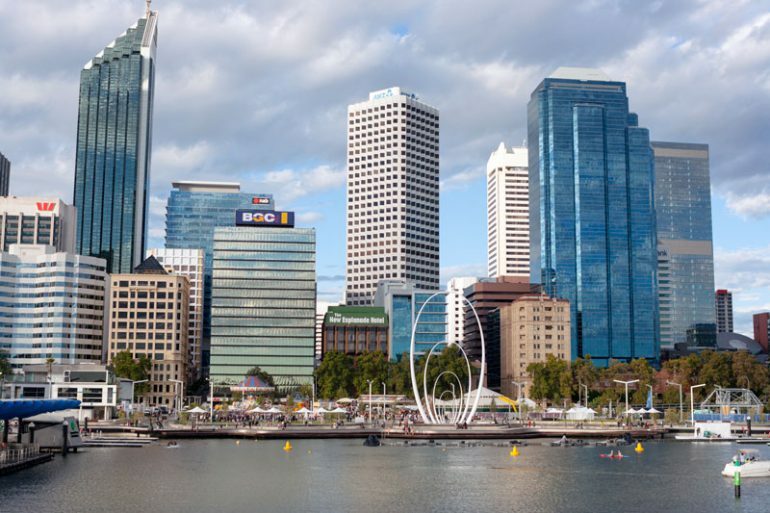 Or simply want to explore Perth. I’ve included a few recommendations of places to eat and drink along the way too. I’d definitely say go check out Elizabeth Quay and make the most of the visit by exploring other sections of the city. 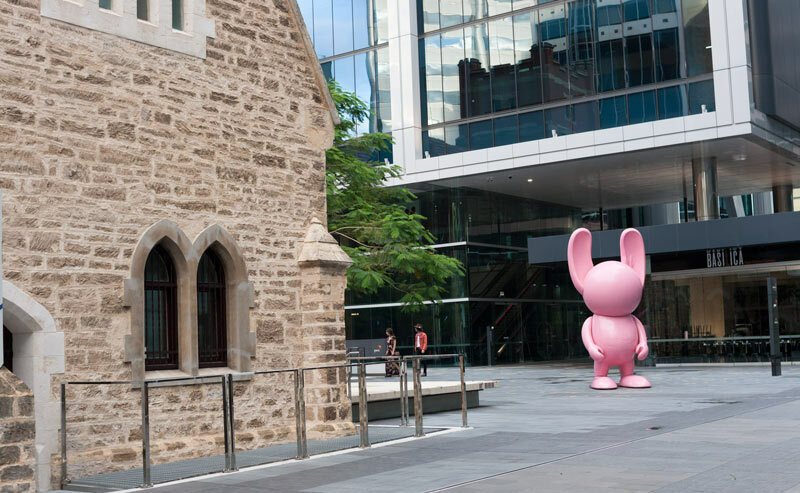 Check out the Cathedral and Treasury precinct or the Friday twilight Hawker Markets. 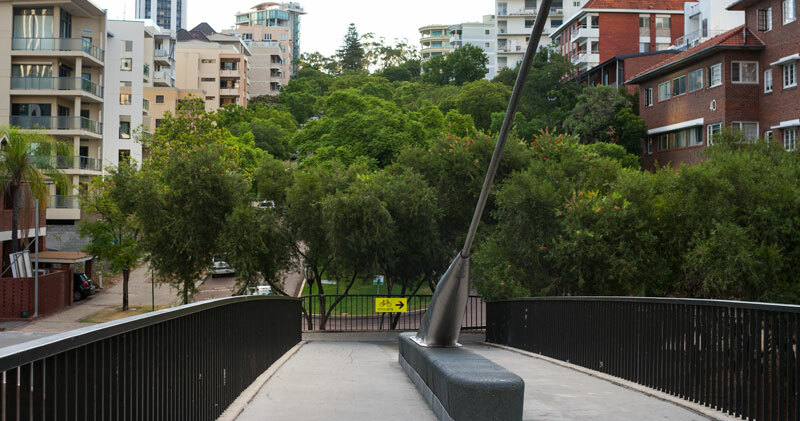 Park at Malcolm Street or Kings Park Road, walk down the street towards the city and take the footpath right before the bridge, follow that until you reach a footbridge on Mount Street that crosses the freeway. There is an apartment accommodation that overlooks the bridge. You are in the right spot. Photo of bridge below. There is also a nice cafe a few metres up Mount Street. After crossing the bridge, you’ll pass Rendezvous Hotel and they have a bar. Stop for drinks? Keep walking and turn right onto Spring Street. 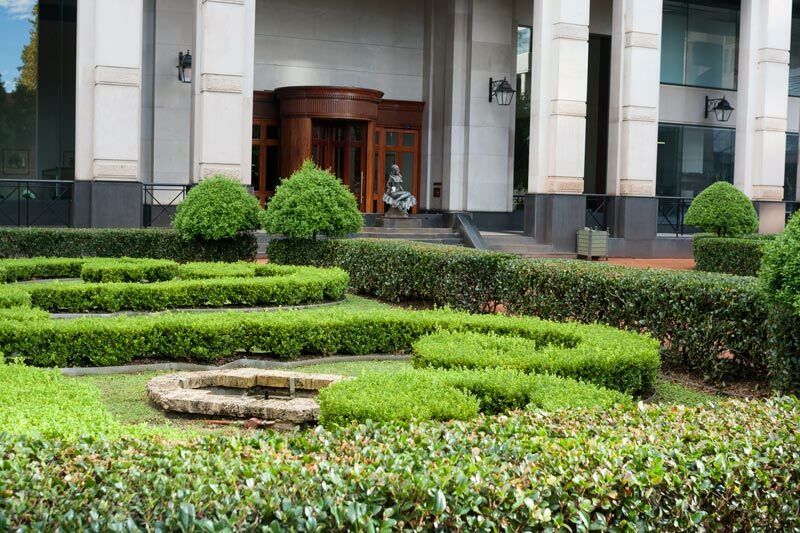 You can check out the tiny secret garden behind Terrace Hotel, it backs onto Lamont’s. If you wish to do this, take the path veering left in the below photo from Spring Street, then right. Return to Spring Street. Once on Spring Street again, or if you never left, walk down to the intersection set of lights. Go straight, crossing the intersection and walk up the set of stairs where the Convention Centre hotel and Perth Convention Centre is located. There is a self-service bike hire by the hotel, $11.00 per day. Keep walking toward the Perth Convention Centre and follow the path between that building and the bus port. From memory you go up a set of stairs again during this process. 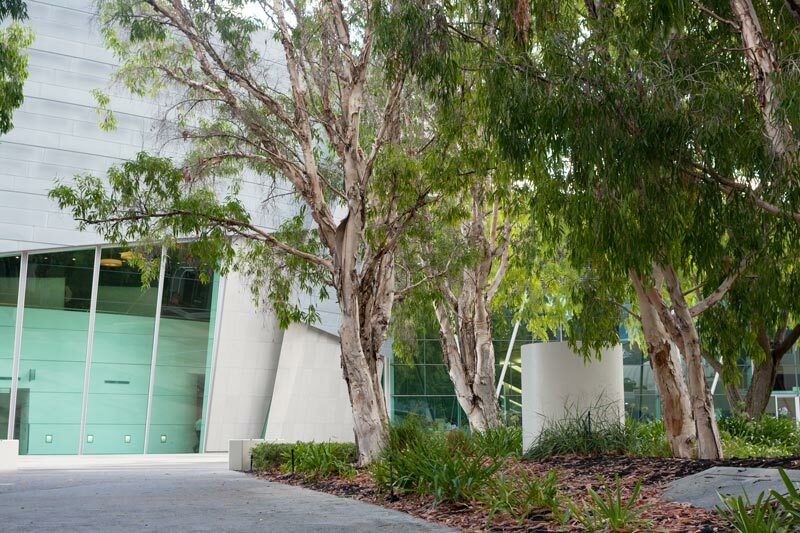 Then to the left a path opens up and you’ll see a row of paperbark trees (pretty cool I thought to stumble across this in the CBD), follow this and you’ll see the Ernst and Young Accounting building. To the right there is a set of stairs going down to the Esplanade Train Station and William Street intersection. 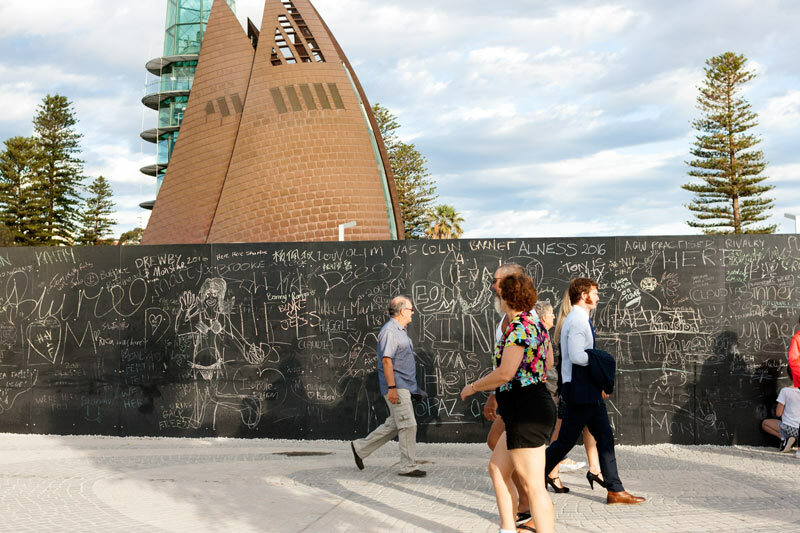 Two options – walk down William street until you hit the river or walk along the Esplanade where you will hit the Fringe Festival and then Elizabeth Quay on the right. 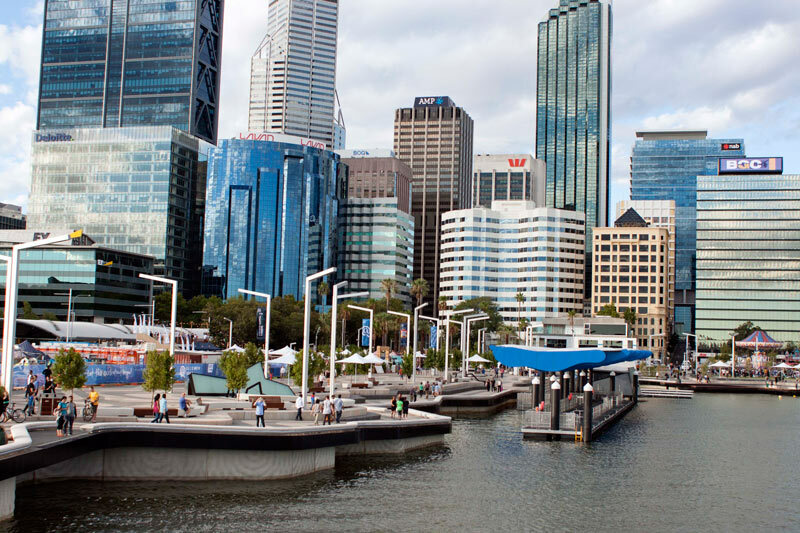 So you’ve seen Elizabeth Quay, now to head back and maybe grab a bite to eat or a couple of drinks along the way! 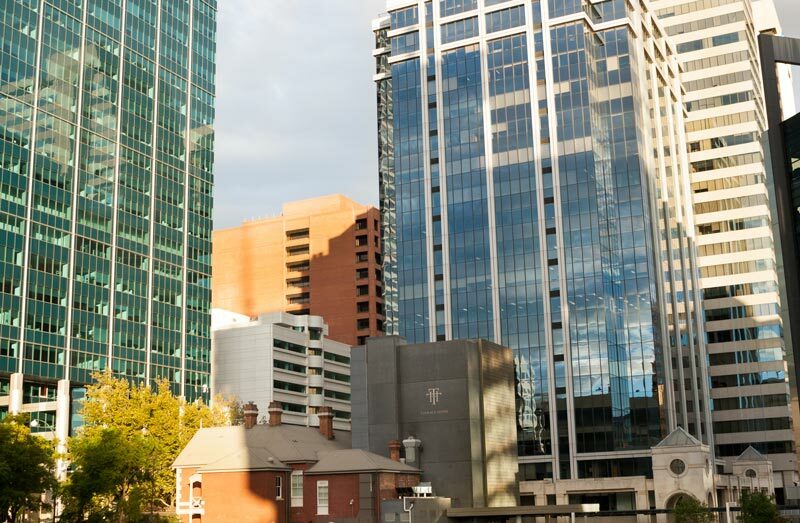 On the return, walk up William Street to the St Georges Terrace intersection and turn left. As you wander along St Georges Terrace you’ll see loads of cool skyscrapers. 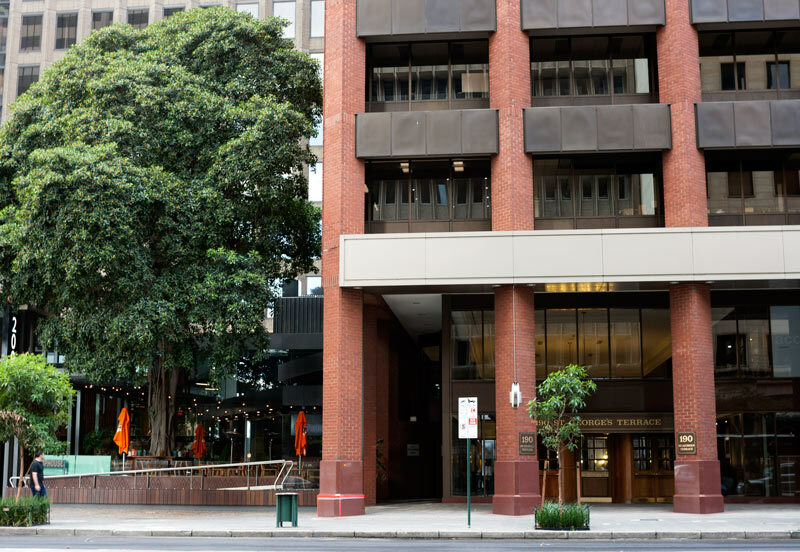 In the way of food and drinks, check out Brookfield place – Grill’d Burgers (budget friendly), Print Hall Bar, The Heritage, The Trustee, Bobs Rooftop Bar. A little further away is The Terrace Hotel, great for drinks in the courtyard. 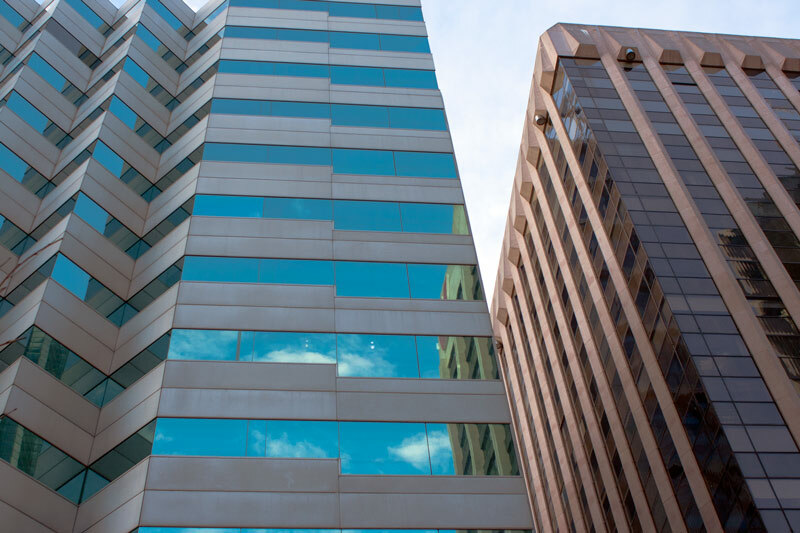 Chophouse is on the other side of St Georges Terrace. Adelphi Grill is on Mill Street in the Parmelia Hilton Hotel. An oldie but a goodie is Matsuri Japanese on Milligan Street. 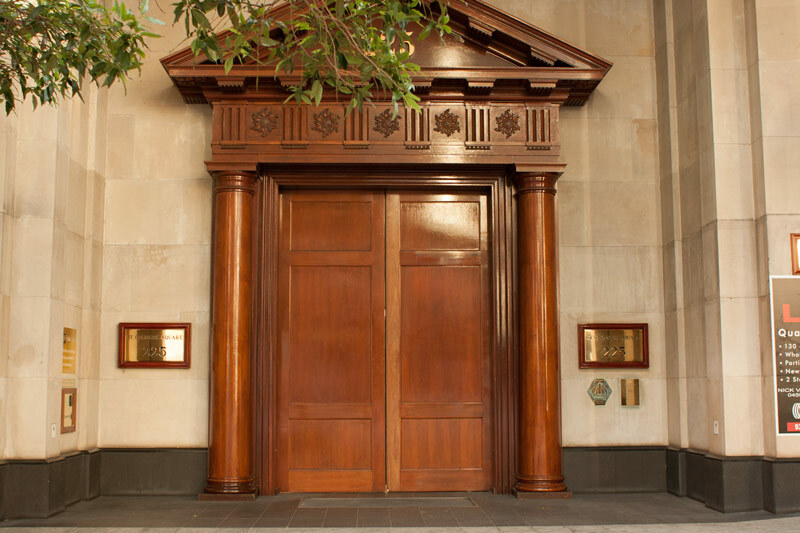 Turn the opposite direction on St Georges Terrace is another great restaurant, Lalla Rookh. 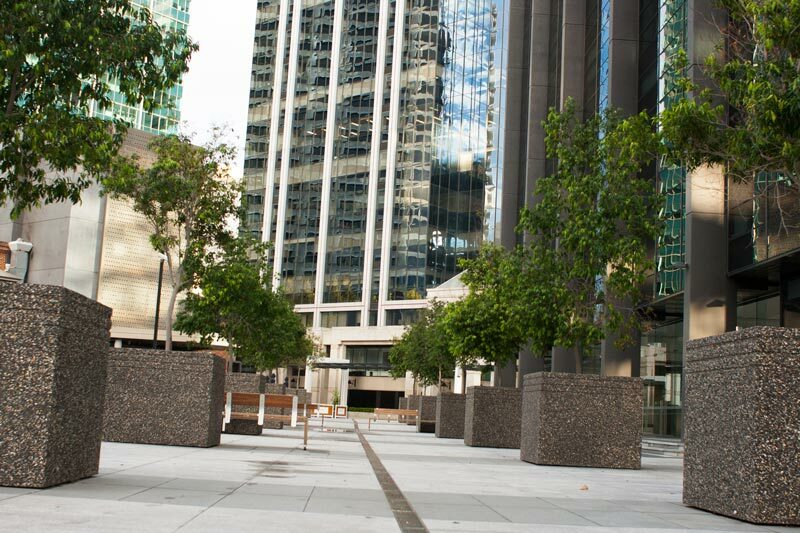 Most of Brookfield Place sits behind this limestone building. A random old tree nestled between skyscrapers. I thought this door was super cool and heard there is a cafe inside? Will have to explore during the week. Although on the map I have directed the route straight up St Georges Terrace and Malcolm Street, you can take the lane to the left just before the Terrace Hotel, veer right where you will walk behind Terrace Hotel and head to Spring Street retracing your steps back to Malcolm Street the same direction you came from. I hope you liked this little walking tour and even more so I hope I didn’t get you lost! Have you seen our Perth travel journal?